Zika virus infection is transmitted by mosquitoes of the genus Aedes: in America, Ae. aegypti is the primary vector and Ae. albopictus is a potential vector. These vectors are currently absent in Québec. Zika virus needs a threshold temperature between 22°C and 26°C for 15 days for replication in Ae. aegypti, and above 27°C for one week for replication in Ae. albopictus. Québec's current summer temperatures are unlikely to allow for an extrinsic incubation period. Therefore, the current risk of vector-borne transmission of Zika virus in Québec is negligible. There is a possibility for a point-source introduction of adult mosquito vectors and Zika virus in the province. 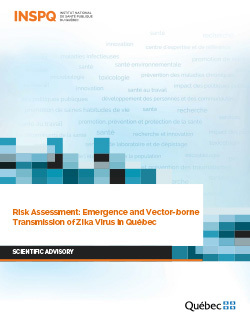 The Institut national de santé publique du Québec (INSPQ) [Québec’s public health institute] is continuing scientific monitoring of the topics and additional questions raised in this risk assessment. Conduct studies on the capacity of Ae. albopictus to survive in the southern Québec climate.